I noticed something very peculiar while training for the Christchurch Half. If you know me well, you'll know that long runs aren't my favourite. Give me hill repeats, fartlek sessions and even tempo runs, but don't ask me to run long. It saps the joy right out of me. Or, at least, it used to. But then, for the first time ever in my 41 years, while training for the Christchurch Half, I noticed that somehow my long runs started feeling easier. Doable. And, hold on to your hats for this one, even enjoyable. Um, what?! Plus I actually had enough energy left in the tank post-run to go on adventures with the kids without feeling like a dead woman walking. This is huge, people. And while the reason(s) for this very unexpected, but delightful turn of events warrant a blog post of its own, just know that I went into the pre-race taper feeling surprisingly strong and ready. Perhaps this is why, then, also for the first time in 41 years, I tapered like an absolute loon. Conjuring up every single niggle imaginable, and feeling as if every sneezing, coughing human in town crossed my path during the taper, I was a bit of a nervous wreck. Thankfully though, despite the (my?) craziness, I reached the starting line healthy and injury-free. I really wanted to clock a new PB at the event (i.e. anything faster than 1:52:21), and, given how good I felt during training, felt hopefully optimistic that it was possible. So, just like I did for the Round the Bays Half last year, I lined up right behind the 1:50 pacer. The rain thankfully stayed away until the starting gun fired and the air temperature was cool but pleasant. And while the course was rather congested until the 10K mark (all the race distances started together), I was able to stay within sight of the 1:50 pace runner for the entire race. I never checked our pace during the race and decided to let the pace runner worry about that for me. I did, however, notice that keeping up with him was surprisingly manageable. In hindsight, I should have double-checked our pace just to be sure, but given how good I felt during training, I wasn't too worried. With rain (more of a constant drizzle) falling for the entire 21.1 kays, I also couldn't help but giggle at how everyone's legs were covered in mud, despite it being a road race. Christchurch at its best, eh? 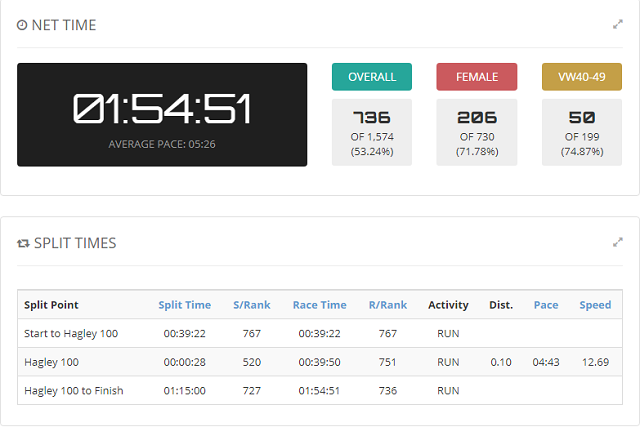 In the end, I clocked a time of 1:54:51, with the pace runner still in sight. Perhaps pacing works a bit differently here, in that, instead of aiming for a sub-1:50, the 1:50-pacer aims to finish before the next pacer's allocated time (which, in this case, was 1:55)? Anyhow, as much as I wanted to clock a PB, I'm still happy with my time. Second fastest half to date, whoop! So, with that, half-marathon #10 is in the bag! Looking back, I can just laugh at how long it took me to pluck up enough courage to make the jump from 10K races to half-marathons - it literally took me years. But I'm so glad I did. The half is and always will be one of my favourite race distances. 4. Dischem Half, SA (January 2011) - 2:04:?? For the next while, I think I'll stick to shorter races and perhaps try chasing some parkrun PBs. And yes, I'm definitely also still dreaming of clocking that sub-50 10K! But for now, I'm looking forward to just putting my feet up and having a good and proper rest. Well done! And I'm sure that sub 50 will be clocked this year. Secret goal of mine too (my best is 53:22 so still a bit to go! LOL). My hygent Saar, aggenee! Jy kon jou PB diep geklap het as die pacer sy sout werd was! Maar WONDERLIK dat jy so goed gevoel het en die pas maklik kon volhou, dis steeds 'n baie, baie goeie tyd! Ek het my les op 2 Oceans geleer met pacers. Die sub7 bus het vir my weggehardloop (!!!) en ek het so gestres. Hulke het NIKS op die hele Chapmans gestap nie, en ek kon net nie bybly nie. Ek het hom gestap-draf. Hukke taktiek was toe om in die laaste 15km dit rustig te vat en baie walk breaks te vat (natuurlik oor hulle MOES want almal was dood op hulle voete!) So uiteindelik, na ek vir 20km lank geglo het ek gaan dit nie maak nie oor ek nie by hulle kon bly nie, toe wen ek hulle met n hele ent. Wys jou. Een mens is nie een mens nie. Elkeen het maar sy eie plan en n pacer kan mens se race heel gooi.